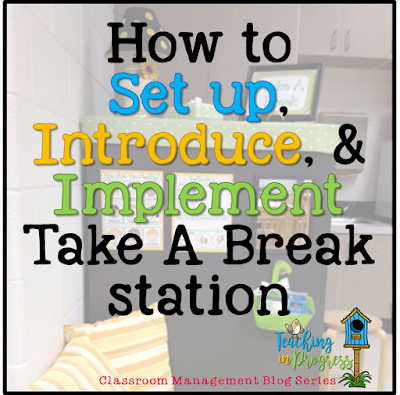 "Take A Break" is a special space in the classroom where children can take a moment to decompress, take a breather, or think about making different choices. 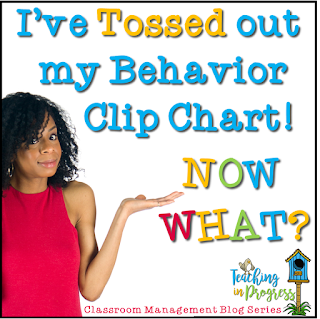 Typically, when students are talking, acting out, bothering others, unfocused, upset, or agitated, they don't always need a consequence, they just need a chance to reset and return. They also need to learn to do this on their own without much adult intervention. Create a designated space in your classroom with a small basket of materials and a comfortable place to sit and write. The place should be inviting, uncluttered, and a bit removed from whole group areas including student tables or desks (if possible). The space should not double as a literacy or math station or other classroom need. The students need to know that this space is available to them at any time. Take A Break is not a "Time Out" because it is not intended as a consequence. You can also have a "Time Out" chair in another place for situations which require a more traditional consequence based approach. The students can go there on their own, but sometimes can be asked to go there by the teacher. There may only be a few students who routinely need this space, however, every child will probably spend some time there. The student will only stay there for about 1 or 2 minutes and use the egg timer so they don't stay too long. If a student visits this station too frequently, it is probably time to discern the reasons for the visits and develop a plan to meet the student’s needs in a different way. It is important to have everyone go there at least once during the first week or two of school so they know what it feels like and understand that it is not punitive. The teacher can also go to the space to model how it is to be used and to reinforce that it is not punitive. The space should not double as a literacy or math station or other classroom need. The students need to know that this space is available to them at any time. Asking “What should happen next?” is an important part of the process. Perhaps a student needs to apologize, clean up a mess, or just try to brainstorm a way to return and feel more settled. Students often feel empowered to create change when they see their behavior as a cause and the effect it has on others. 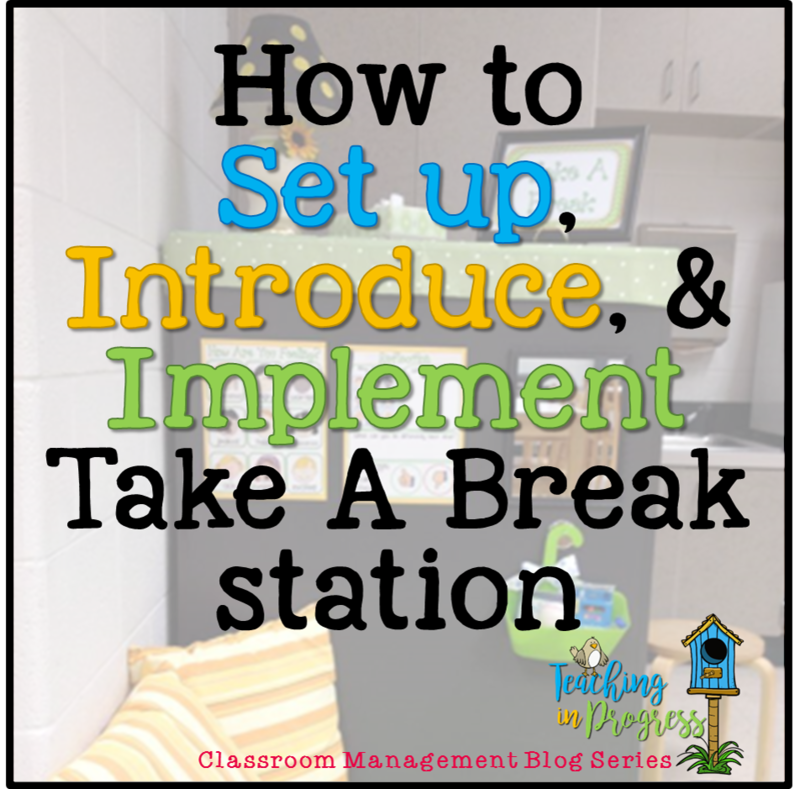 The procedure for introducing Take A Break should be introduced just like any other procedure you use in your classroom. Explain the reason a student may choose to go, or be sent, to the station. I usually tell them that strong feelings or the need to refocus are the main reasons for a visit. 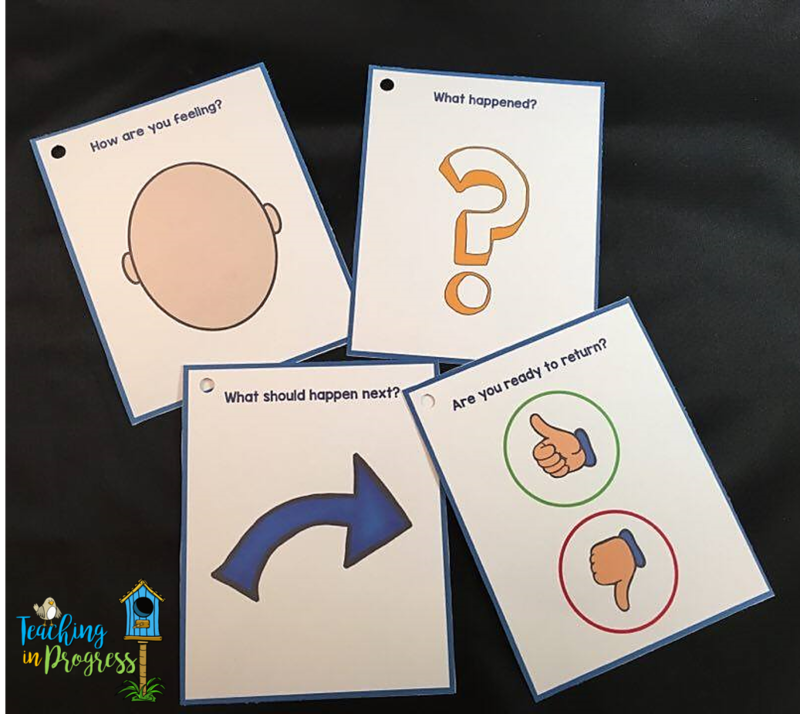 It is helpful to introduce lessons on recognizing and identifying different feelings and emotions. Model how to use the materials. You may want to introduce them slowly over time, or at least change out materials every so often so there aren't too many choices in the space at any one time. This process can be prompted with pictures, props, or a written reflection worksheet. If the child's emotions are very strong, they can use the calm down materials to settle themselves. Practice using the space and materials. Make sure every student has a chance to go there for a bit after it has been introduced to remove the curiosity factor as well as any fear of going there. Try to help the students feel that the space is a place to regain composure, not a "bad" place or punishment. If you are using reflection sheets or materials, preschool children, other non readers or early readers will need something more visual. An adult should guide a young child, a student without reading skills, or any student who is unable to work through the station independently, through the reflection process, until they have memorized how to work through each step on their own. Picture prompt cards or props are a great choice. I absolutely love this, and have been doing something similar (but not nearly as intentional and structured) for several years. 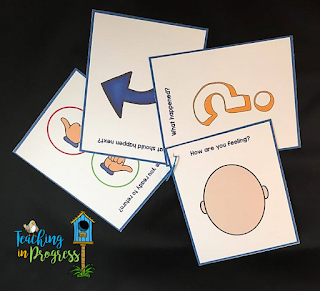 I can't wait to use your materials and actually teach my students self-regulation, while encouraging a growth mindset! Thank you! I wish you the best year possible and hope you and your students find success with this! I just purchased your Take a Break Management system. I look forward to using it this year. There are just so many kiddos with Social-Emotional issues and we need to address there needs.